It’s finally happening!! SITEX being one of the 4 major IT Show, it is always well looked forward to every year. Not forgetting the fact that it always occurs so close to Christmas season, it is no doubt one of the ideal place considered for Christmas presents…. SITEX 2015 @ SINGAPORE EXPO. This year’s SITEX is a really special one for ViewQwest. Not only are we celebrating ViewQwest’s 14th birthday, we also have 2 booths this year showcasing many different side of ViewQwest. 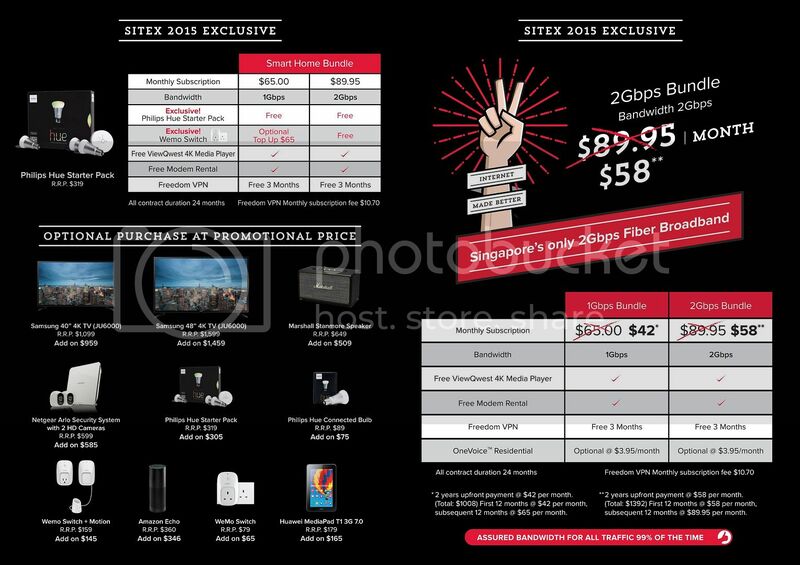 Our 1Gbps Fibernet is going at $42/mth, and 2Gbps at just $58/mth exclusively only for SITEX! Along with the special offer, ViewQwest has plenty of SMART gadgets for your ideal SMART home! 2. SMART Home Set-up & Gaming corner! Located at the back of Singapore EXPO Hall 6 is a live SMART Home set-up! Experience how SMART home work with SMART gadgets from ViewQwest! There is also gaming corner, sponsored by ViewQwest’s fibernet, available for you to play! 3. Spot the ViewQwest vehicles! Situated right in between the Foodcourt and Burger King is the exclusive ViewQwest BMW ALPHINA. ViewQwest is proud to be bringing you a chance with exclusive rides on the BMW ALPHINA with sign-ups at the SITEX show! Not only that, we also have a booth showcasing a couple of well decal-ed vehicles like the Can-Am Spyder, sleek MV Agusta super bike, and Sea-Doo Watercraft Jetski! Don’t miss this rare chance to snap a photo with theses super vehicles close-up! Stand a chance to win a ride home on the BMW ALPHINA with every sign-up at the SITEX Show! Just pick out the lucky ball with a red dot to win! Also, with every sign-up, you are eligible for a lucky draw to win a weekend test-drive on the BMW ALPHINA! ViewQwest is proud to be the main sponsor the SITEX Grand Draw! Bring home the Can-Am Spyder when you participate in SITEX’s Lucky Draw! With so many exciting stuff going on, what are you waiting for? Hollah everybody! It’s mid week, and I have some good news for you!! As mentioned in my post last week…. SITEX 2015 is coming!! I am extremely excited for this coming PC show because I am finally going to upgrade my home and room with tons and tons of awesome gadgets. Espeically a brand new upgrade for my PC. Yes…. I am finally going to get myself a brand new laptop that doesn’t die on me on crucial days! Anyway….. From 26-29 November, at Singapore EXPO Hall 5 and 6, ViewQwest will be part of SITEX 2015 with lots and lots of awesome deal! Not only will we be featured at 2 booths this time, there will also be showcase of the BMW ALPINA wrapped in ViewQwest’s exclusive red & black label, keep your eyes open, and look out for it! Bringing you a whole new experience with SMART home, ViewQwest will be bundling up with exclusive SMART home product this coming SITEX, too! Not forgetting the SMART home set-up available at our booth too! With ViewQwest celebrating its 14th birthday this year, there will also be many exclusive prizes for ViewQwest’s customers. This will include exclusive lucky draws at the ViewQwest booth for all onsite sign-ups, winners will be chauffeured home in a BMW ALPINA! Not only that, all sign-ups at the SITEX 2015 will get a chance to win an exclusive BMW ALPINA weekend test drive! With that said, ViewQwest is also proud to be the main sponsor for SITEX 2015’s grand prize. The ever awesome Can-Am spyder will make it’s appearance again at the ViewQwest booth in Hall 6, and also at our sponsor’s booth at Hall 5! Be ready to be greeted by the usual ViewQwest babes this coming weekend, and get blown away with exclusive deals in celebration of ViewQwest’s 14th birthday! Meanwhile, hop over to our Facebook page to get exclusive updates, and don’t forget to stay tune for our next post to find out what ViewQwest has to offer during the show. Trust me, you wouldn’t want to miss this. See you at Singapore Expo Hall 6, Booth 6D01, this 26-29 Nov 2015! A walkthrough the Smart Home of today! I popped by our CEO, Vignesa’s nest today! It was a total eye opener. Considering the fact my house looks like a tornado went through it…. I believe even if I were to have a SMART gadget set-up at my house, the connection will be hindered by the junk lying around, hahahaha. Anyway. I walked into a vision of a digital future. Back to the Future Day was just announced a few weeks back and I am undoubtedly super stoked to be traveling into a dream home that I am able to control, at the comfort of my smartphone. Fully equiped with SMART gadgets, most of the appliances can be controled through the WeMo application for Smartphone! Use it to monitor the movements outside your door when you are away from home. You can even set up a “temporary pass” for a guest to access the lock on your front door with his smartphone while motion sensors can automatically turn on lights at the porch when it detects movements after midnight with the wireless Arlo cameras! You can even use your voice to turn on the lights, or dim them when you are enjoying a movie marathon night using the Amazon Echo voice commander. If you are too lazy, just ask Echo what time is it, she’ll answer you right back. It is ultra cool because all of these functions were only seen in movies, and film producers/director had to post-produce the footage to achieve such idealogies until recent years! And not forgetting the color switchable lights from Philips. The Philips Hue smart lighting system comes with a start pack of 3 bulbs and wireless bridge. You can change the light to whatever color you want using the application. Speaking of which, ViewQwest e-store now retails a handful of smart gadgets such as the Amazon Echo voice commander, the battery-powered Arlo wireless cameras and the Philips Hue smart lighting system! And ViewQwest will double the products to about 50 by early next year! That is not all. At the upcoming SITEX show next week, ViewQwest will also feature these SMART Home products. The Smart Home vision is not that far away after all! Also, to celebrate ViewQwest’s 14th birthday, 14 lucky winners will stand a chance to win a chauffeured ride home on the BMW ALPINA with every ViewQwest Fibernet sign-up at the SITEX 2015 show! Also all ViewQwest sign-ups at SITEX will also stand a chance to win an exclusive weekend test drive on the BMW ALPINA. ViewQwest is the official sponsor of the Grand Prize for SITEX 2015’s lucky draw! Stand a chance to bring home the Can-Am Spyder when you shop at SITEX! 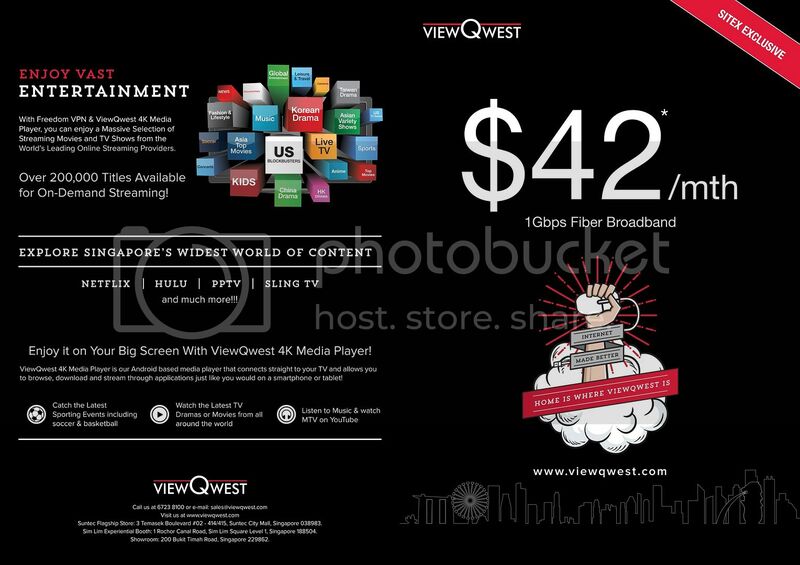 We also have plenty of other amazing offers up for grab to celebrate ViewQwest’s 14th birthday! And yes… I will finally be there for the show over the 4 days! Hahahaha. See you guys at SITEX 2015!